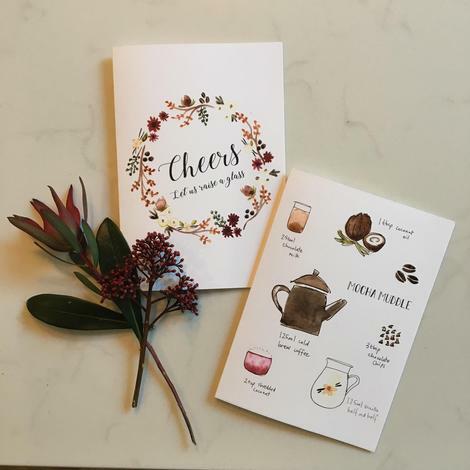 In case you’ve been living under a rock or are brand new to the scene, Brit Lucy Wilkins and her New York-based business partner Sara have made quite the (booze-free) splash in 2018 with their biz, We are in Good Company (weareingood.co). Their vision is to make space for sober by creating a world where it’s just normal to be living life substance-free. And they do that through whimsical greeting cards with messages that are simple, quirky, funny, powerful. For Dry January, Lucy and Sara are featuring a different sober rockstar every day on their Instagram feed and asking them poignant questions about why they choose sober. [I was day 14 - since January 14th was my 11.5 year anniversary <3]. Get ready for a big year with Lucy and Sara and weareingood.co! Trust me when I say we’re in good company! I stopped drinking to support a loved one who had issues with alcohol. I've always been able to take it or leave it, know when I've had enough and call it a night. My loved one doesn't - they have no off switch. Watching them as they slowly got deeper and deeper into the clutches of alcohol was heartbreaking. Fortunately they stopped and little by little they turned their life around. I was so impressed by the change, the huge and positive impact it had made on their life that I was inspired to give it a go too. I can honestly say it has surprised me how much better I feel... I didn't have an 'issue' with alcohol but without it I have more patience, more time and more energy. I very rarely miss it. Sure, Christmas is harder when everyone equates festive fun with having a drink but I look at my kids and see how much fun they're having just high on life and the feeling soon dissipates.